The Spectacled Avenger: Lord Shaftesbury, "Characteristicks of Men, Manners Opinions, Times"
Lord Shaftesbury, "Characteristicks of Men, Manners Opinions, Times"
Lord Shaftesbury, Characteristicks of Men, Manners, Opinions, Times (Indianapolis: Liberty Fund, 2001). I’ve spent several years of my life studying philosophy, finally earning a doctorate in the subject (and thereby educating myself beyond the hope of gainful employment). And yet, in all that time, the name of my favourite philosopher was uttered not once by any of my professors in any of the many philosophy courses I took. 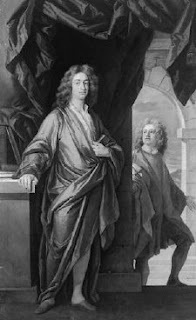 That favourite philosopher is Anthony Ashley Cooper, 3rd Earl of Shaftesbury (1671-1713), author of Characteristicks of Men, Manners, Opinions, Times, which is absolutely my favourite book of all time. I cannot adequately do justice to this complex and fascinating work here. Instead, I will merely give an outline and a select bibliography for anyone interested in reading further. In addition, I have the unpublished manuscript of a book I wrote on the work, and if anyone is interested in it, I will happily e-mail it to them. Shaftesbury (pictured above) was the grandson of the first earl, political rabble-rouser, one of the founders of the Whig party, and celebrated (or rather reviled) by John Dryden in his “Absalom and Achitophel” (1681) in the character of Achitophel (1681), ll. 151-155: “A Name to all succeeding Ages Curst. / For close Designs, and crooked Counsels fit; / Sagacious, Bold, and Turbulent of wit” (ll. 151-153). The first earl escaped treason charges by fleeing to Holland, where he died in 1683. The second earl, the father of our author, was by most accounts useless, so the grandfather exercised a disproportionate influence on the life of his grandson, who inherited his legacy of religious toleration, freedom of speech, a hatred of tyranny, and republicanism and firm Whig principles. The third earl destroyed his health — which in any case was never very robust — pursuing an early political career. Afterwards, he retired to a life of study and contemplation. After a late marriage, he took himself to Naples for health reasons, where he died in 1713. From what I can make out, it is quite probable that he was homosexual, but that is neither here nor there. Characteristicks of Men, Manners, Opinions, Times (hereafter, simply Characteristicks) is in reality a collection in two volumes of Shaftesbury’s previously published writings or “treatises”, tied together and supplemented by a third volume of “miscellaneous reflections” on the foregoing by Shaftesbury, writing in the voice of an anonymous (but appreciative) critic. The first edition appeared in 1711. However, Shaftesbury was busily revising it for a second edition while in Naples, and he commissioned a set of incredibly fascinating emblematic engravings from Simon Gribelin to illustrate its contents. To give you some impression of their beauty, the pictures at the header and footer of this webpage are details from two of those engravings. This second edition appeared in 1714, following Shaftesbury’s death. There have been many editions since then; indeed, despite its current obscurity, it was one of the most frequently reprinted English works of the eighteenth century. The 1714 edition appears pretty much as Shaftesbury would have wished and is in that sense standard. The best modern edition is that published by Liberty Fund in 2001. It is the best for several reasons. First, it is relatively inexpensive and easy to acquire. Second, it contains quality reproductions of Gribelin’s engravings, which are an integral part of the work and should never be omitted from it. Third, it is divided appropriately into three volumes, and conveniently gives the pagination to the original edition in the margins; this is important, because the engravings have numbered references to certain passages. Fourth, it provides translations of Shaftesbury’s Greek and Latin quotations. If it has any flaws, it is that there are too few explanatory notes: for these the reader must consult Philip Ayres’ Oxford University Press edition (1999), which besides being very expensive and rare, has many other drawbacks. The first volume consists of three treatises: (i) A Letter concerning Enthusiasm, (ii) Sensus Communis: An Essay on the Freedom of Wit and Humour, and (iii) Soliloquy: or, Advice to an Author. The Letter was originally published anonymously in 1708. Interestingly, when it came out, many of Jonathan Swift’s friends assumed it was his (for his part, Shaftesbury cordially hated Swift’s work). It is now a very rare pamphlet, but I happen to own a first edition of it. It was written as an occasional piece, ostensibly on the subject of the Camisards or so-called “French Prophets”, a sect of French Protestants who had come to London fleeing persecution. They upset many with their habit of preaching the coming Apocalypse loudly in public places, along with speaking in tongues and various other “enthusiastick” behaviours. They were perceived by many to be a threat to public order, and there were calls for their suppression. Shaftesbury, on the other hand, becomes their unlikely defender. He argues that there will always be “enthusiasts”, and their activity is compared to the discharge of unhealthy and excessive humours. It is best to let them vent some steam, lest it come out in other ways that could be even more damaging to public order. To suppress them will only worsen things, and might even gain them adherents and sympathizers by making them appear as martyrs. In short, enthusiasm is normal and even necessary, while excessive enthusiasm is seen as a quasi-medical or physiological condition which must be allowed to run its course. The work abounds in medical metaphors. Sensus Communis (literally, “common sense”, though in Shaftesbury’s time it did not quite mean the same thing as it does to us) was first published in 1709, and picks up where the Letter leaves off. It presents what Shaftesbury’s critics came to call his “doctrine of ridicule”. In effect, Shaftesbury suggests that if you really want to get rid of ethusiastics like the Camisards, the best way is to subject them to polite ridicule. We lend them too much credibility when we take them seriously. Rather we should subject them to raillery, making them look ridiculous rather than dangerous. We should also not be afraid to subject other religious claims — even established ones — to ridicule, for if there is any truth to such claims, the truth will prevail and the ridicule will seem ridiculous in its turn. Thus, satire plays a vital function in the marketplace of ideas. We ought not to be afraid of offending, so long as the discourse is carried out in a “polite” manner (one must read the rest of his works to understand exactly what Shaftesbury means by “polite”). As he puts it, “all Politeness is owing to Liberty. We polish one another, and rub off our Corners and rough Sides by a sort of amicable Collision. To restrain this, is inevitably to bring a Rust upon Mens Understandings.” Perhaps this seems to our modern ears hopelessly naïve and optimistic, but it was a novel and very controversial idea at the time. Besides his doctrine of ridicule, Sensus Communis insensibly turns into a piece of moral philosophy, criticizing the then-fashionable theory of Thomas Hobbes that man is essentially a selfish animal, who only does good for self-interested reasons. To this, Shaftesbury rightly says that “for those who have no better a Reason for being honest than the fear of a Gibbet or a Jail; I shou’d not, I confess, much covet their Company, or Acquaintance”. Most of us refrain from murder because it is wrong, not because we are afraid of punishment. Soliloquy first came out in 1710, and was ostensibly a work of literary criticism, purporting to advise authors on effective writing. In reality, it is more far-reaching, presenting us with a prescription for moral self-development. In short, Shaftesbury advises us to make a habit of literally talking to ourselves. We have two selves within us, one of which is the voice of conscience or reason. We must develop the habit of listening to this voice, and the best way of doing so is to let it speak. That is the best way to find out how ridiculous we are, thus saving us from public embarrassment and moral lapse. In my opinion Soliloquy is one of Shaftesbury’s best pieces (the other being The Moralists, below), but it contains too much brilliance for me to do justice to it here. The second volume contains the core of Shaftesbury’s philosophy. It consists of two treatises: An Inquiry concerning Virtue, or Merit, and The Moralists, a Philosophical Rhapsody. The Inquiry was originally an early work, published in 1699. It was published without Shaftesbury’s permission, and according to tradition, he tried to buy up and destroy the entire printing. He thoroughly reworked it for inclusion in Characteristicks. Insofar as modern philosophers pay any attention to Shaftesbury at all, their attention is focused almost exclusively on the Inquiry, probably because it is the most “philosophical” of his works, the most systematic and treatise-like. Unfortunately, it also happens to be a very limited window on Shaftesbury’s thought as a whole. To know him through the Inquiry is to know him little. Shaftesbury himself criticizes this early work, and the dry kind of philosophizing it contains, in the third volume of Characteristicks. The Inquiry deals with two related subjects: the nature of virtue, and the relation between religion and ethics. As far as the latter goes, Shaftesbury sees very little relation indeed, and here he follows his friend Pierre Bayle, who believed that a virtuous society of atheists was quite possible: “If we are told, a Man is religious; we still ask, ‘What are his Morals?’ But if we hear at first that he has honest moral Principles, and is a Man of natural Justice and good Temper, we seldom think of the other Question, ‘Whether he be religious and devout?’.” The rest of the Inquiry is devoted to showing that virtue is to the benefit of the agent and to the system of nature as a whole, while vice is to the agent’s ill. It lays out an optimistic theodicy that came in for much criticism by intellectual lightweights like Voltaire. The Moralists is possibly the best example of a philosophical dialogue ever written in English. Indeed, it contains dialogues within dialogues, sometimes effectively masking Shaftesbury’s real voice, particularly where that voice might be expressing heterodox ideas. The main dialogue takes place between Philocles and Theocles (whose persona is closest to Shaftesbury’s), recounted in a letter from the former to his friend Palemon. Theocles’ method of philosophy is rhapsody, flights of enthusiastic celebration of the order of things. These flights are expressed in language of supreme beauty, making Shaftesbury one of the most impressive prose stylists ever to write in English (Joseph Addison is second, in my opinion). Shaftesbury appears as Theocles in Pope’s Dunciad, where is words are transcribed — or transprosed — into blank verse. (Incidentally, Pope lifted much from Shaftesbury’s works without giving him due credit). Bishop Berkeley did the same in his Alciphron, or the Minute Philosopher (1732), which I believe is possibly the second-best philosophical dialogue in English. As mentioned above, the third volume of Characteristicks contains only one work, the Miscellaneous Reflections on the preceding Treatises. Here Shaftesbury shows himself to be a consummate wearer of masks, very much in the spirit of Swift. He takes on the persona of an anonymous critic, and offers systematic commentary on his own work. It is written very much in a spirit of effective irony. For instance, he devotes considerable space to criticising the fashionable practice of writing miscellaneous pieces! His wit is drier, more aristocratic than Swift’s, but one can see why they were so often compared (and confused) by their contemporaries. Otherwise, the Miscellaneous Reflections are of most interest for the footnotes. Shaftesbury has chosen to wear masks because he has much to say that is unorthodox and controversial, particularly on questions of politics and religion. He has chosen to bury much of this in his notes, much as his friend Bayle was wont to do. Characteristicks is a complex work and is endlessly interpretable, which is why I have been re-reading it constantly for at least seven years as if it were the Bible. Much of the matter it contains is too subtle, or too disguised, to be captured on first reading. And best of all, it is composed in what is perhaps the most elegant and beautiful English prose ever written — a high commendation indeed, given the barbarous degeneracy of most philosophical writing. BRETT, R. L. The Third Earl of Shaftesbury: A Study in Eighteenth-Century Literary Theory. London: Hutchinson’s University Library, 1951. GREAN, Stanley. Shaftesbury’s Philosophy of Religion and Ethics: A Study in Enthusiasm. Athens, OH: Ohio University Press, 1967. KLEIN, Lawrence E. Shaftesbury and the Culture of Politeness: Moral discourse and cultural politics in early eighteenth century England. Cambridge: Cambridge University Press, 1994. PRATT, James. A Companion to Shaftesbury’s “Characteristicks” [unpublished manuscript]. VOITLE, Robert. The Third Earl of Shaftesbury, 1671-1713. Baton Rouge, LA: Louisiana State University Press, 1984.